Q.1 Which of the following property is generally not shown by metals? Q.3 Aluminium is used for making cooking utensils. Which of the following properties of aluminium are responsible for the same? Q.4 Which one of the following metals does not react with cold as well as hot water? Q.5 Which of the following oxide(s) of iron would be obtained on prolonged reaction of iron with steam? Q.6 What happens when calcium is treated with water? Q.7 Generally metals react with acids to give salt and hydrogen gas. Which of the following acids does not give hydrogen gas on reacting with metals (except Mn and Mg)? Q.9 Which of the following are not ionic compounds? Q.10 Which one of the following properties is not generally exhibited by ionic compounds? Q.11 Which of the following metals exist in their native state in nature? Q.12 Metals are refined by using different methods. Which of the following metals are refined by electrolytic refining? Q.17 Generally, metals are solid in nature. Which one of the following metals is found in liquid state at room temperature? Q.18 Which of the following metals are obtained by electrolysis of their chlorides in molten state? Q.19 Generally, non-metals are not lustrous. Which of the following non-metal is lustrous? Q.20 Which one of the following four metals would be displaced from the solution of its salts by other three metals? Q.26 Alloys are homogeneous mixtures of a metal with a metal or nonmetal. Which among the following alloys contain non-metal as one of its constituents? Q.27 Which among the following statements is incorrect for magnesium metal? Q.28 Which among the following alloys contain mercury as one of its constituents? Q.29 Reaction between X and Y, forms compound Z. X loses electron and Y gains electron. Which of the following properties is not shown by Z? Q.30 The electronic configurations of three elements X, Y and Z are X — 2, 8; Y — 2, 8, 7 and Z — 2, 8, 2. Which of the following is correct? Q.31 Although metals form basic oxides, which of the following metals form an amphoteric oxide? Q.32 Generally, non-metals are not conductors of electricity. Which of the following is a good conductor of electricity? Q.34 Which of the following non-metals is a liquid? Q.35 Which of the following can undergo a chemical reaction? 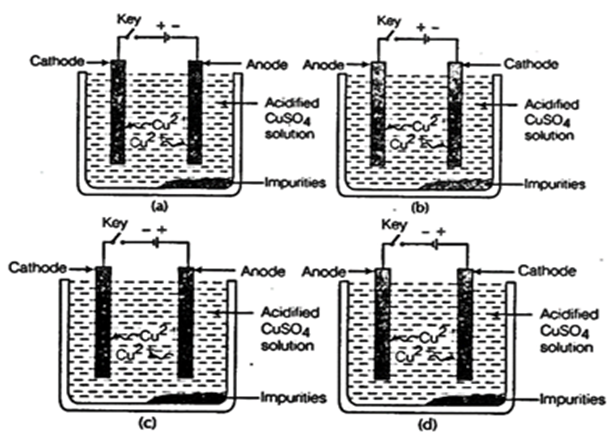 Q.36 Which one of the following figures correctly describes the process of electrolytic refining?